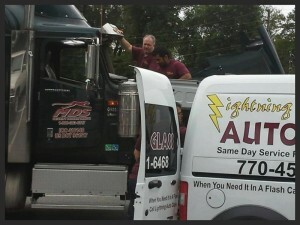 Lightning Auto Glass prides itself in having the best Windshield Installers in the Metro Atlanta area. We always have 2 Installers on every job to ensure the best and safest fit. We also use the highest quality adhesives and fasteners to ensure your safety. In addition, we have one of the largest auto glass and windshield inventories in Georgia, giving us the fastest access to the right glass for your vehicle. Whether you want the top of the line or the most economical auto glass, we have what you need. Furthermore, because we are independent, we can offer you the most competitive prices while providing the highest quality products in the industry. Lightning Auto Glass offers 3 different types of Auto Glass and Windshields: Original Equipment Manufacturer (OEM), Original Equipment Equivalent (OEE), and after-market auto glass. We can help you determine your best option based on your needs and budget. Using our computerized auto glass and windshield quoting system, we can give you a fast accurate quote by phone, on our website, or in person. Lightning Auto Glass is approved by all major insurance companies and is networked to file your insurance claims. Click here to get an online auto glass estimate now! A chipped or damaged windshield is not only annoying, but it also compromises you and your passenger’s safety. Don’t put off having your damaged windshield replaced any longer. Call Lightning Auto Glass today at (770) 451-6468! When Should I Have My Windshield Replaced? The need for a windshield replacement depends on the size, location and severity of the damage to your windshield. The majority of windshield repair shops can repair quarter-sized rock chips and cracks up to three inches long. For more extensive damage, complete windshield replacement is recommended. The location of the damage to the windshield also plays an important role in determining your windshield’s fate. Cracks at the edge of the windshield tend to spread very quickly and can compromise the structural integrity of the windshield glass. If caught in time, some cracks can be easily repaired, but in many cases a complete windshield replacement is advised. The majority of auto glass facilities will not repair a rock chip that is directly in the driver’s line of vision. Because the repair process leaves minor distortions in the windshield, many shops prefer to replace the windshield rather than compromise the driver’s clear view of the road ahead. Regardless of the size and location of a chip or crack, it should be repaired quickly. If you wait to repair it, dirt can work its way into the damaged area which will alter the effectiveness and clarity of the repair. In addition, cracks can spread over time. Whether you need a rock-chip repair or a complete windshield replacement, the technicians at Lightning Auto Glass can evaluate the damage to your windshield and offer the best solution for you and your vehicle.